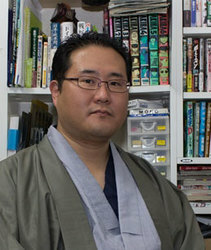 Manga author and artist. Born 1973 and lives in Tokyo. His current projects include: Girls und Panzer - The Samurai Warrior with the Red Ribbon as well as Maki the Shidenkai Pilot (five volumes published from Akita Shoten's Champion Red Comics series), Marine Corps Yumi (four volumes published from Seikai-sha's Saizensen 4 pages series), and Moe Style Tank School (published by Ikaros Shuppan). Nogami also publishes an original doujinshi series The Azure Century Chronicles which features both Japanese and English as translated by Dan Kanemitsu.